Note: Brooklyn Bedding was early to the online-mattress game, and now has a variety of models in its lineup. This review covers the Brooklyn Signature mattress, a hybrid bed made with foam over pocketed coils. We have also provided our review of the Brooklyn Aurora mattress, a more expensive hybrid bed made of foam and memory foam over pocketed coils, and with several specific features to keep you cool. Additionally, the company's Brooklyn Bowery bed is an all-foam entry-level mattress. If you’d prefer to watch rather than read, check out our full Brooklyn Signature mattress video review above. GoodBed's Take – Who is the Best Match for a Brooklyn Signature Mattress? Brooklyn Bedding was one of the early players among mattresses available mainly online. They started with just one model; that original model has evolved into the Brooklyn Signature mattress, a hybrid-style bed with a pocketed coil support layer, with four inches of its proprietary TitanFlex foam above, topped with a plush quilted cover and more comfort foam. While the manufacturer calls this an 11.5-inch mattress, we found that it measures closer to 12.5 inches once the loft of the quilted cover is factored in. The Brooklyn Signature mattress comes in three firmness levels: Firm, Medium, and Soft. We evaluated the most popular version, the Medium. In our evaluations, we found the medium version of the Brooklyn Signature mattress to have what we would describe as a medium-firm comfort level on our scale. In our view, the mattress combines a feeling of floating on top of the mattress with a deep and plush cover, giving it a cozy and soft feeling without a deep sinking-in effect. We thought it would appeal to those who prefer a traditional mattress feel as opposed to today's trend of memory foam, with its slow-response and feeling of being enclosed or cradled by the mattress. In our evaluations for back support and spinal alignment, we felt that this mattress would suit a wide variety of people who sleep in a variety of position, and one of those rare mattresses that offered our testing excellent support and alignment whether on his back, stomach or side. Because of this, the Brooklyn Signature mattress might also be a suitable for couples who tend to sleep in different positions. Another bonus for couples: motion isolation is very good in our tests, so in practical use, that means partners are unlikely to be disturbed by each other's movements. Sitting and sleeping on the side of the bed, and ease of movements were additional highlights in our tests. There were several instances where we wondered whether a different version of this mattress (i.e. the Firm or Soft versions) might be better suited to certain individuals. Head below to our detailed section on Back Support and Spinal Alignment for more on that. 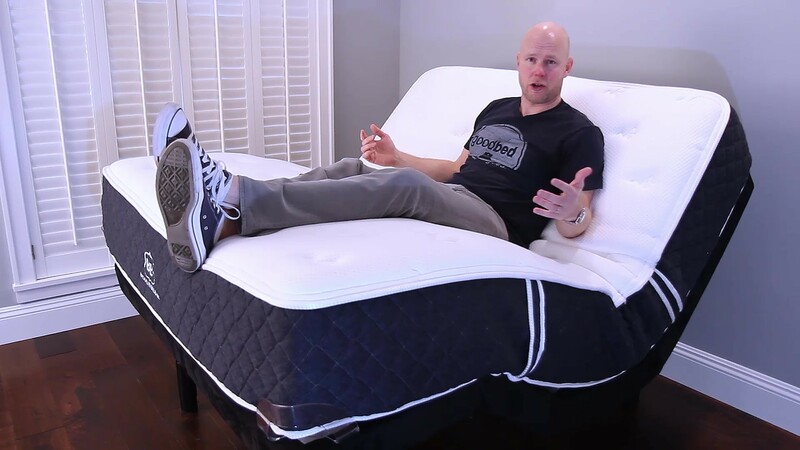 We also questioned durability and longevity with the Brooklyn Signature mattress, not because we experienced any obvious issues, but mainly because the foams used in the mattress are proprietary--a company formula that doesn't have a long track record. While we can typically use the density of polyurethane foams and memory foams as a clue to durability, in the case of Brooklyn Bedding's TitanFlex material, we don't know if its stated 3.5-lb. density will be comparable from a durability standpoint to foams that have a longer track record. On the plus side, Brooklyn Bedding does offer a 10-year warranty with a 1-inch body-impression depth, so any significant breakdown in the bed's foams should be covered under that policy, giving consumers peace of mind. You can place the Brooklyn Signature mattress atop the support of your choice, including a separately purchased box support (a proper support is required or you can void the warranty), a bed frame, platform bed, or adjustable bed frame. Brooklyn Bedding does sell its own box frame, metal frame, and adjustable base, but none of these are required purchases. The five layers of the Brooklyn Signature mattress progress from softest to firmest from top to bottom. The topmost layer of foam is actually quilted right into the non-removable cover of the mattress and has about an inch and a half of loft all on its own. Next are two layers of the company's TitanFlex foam, infused with gel to promote heat regulation. The upper layer of TitanFlex is softer while the second layer acts as a firmer transition layer before you get to the pocketed coils. The lower foam layer at the bottom doesn't serve a comfort purpose; its there to serve as a base and protector for the coils. The five layers of the Brooklyn Signature mattress are wrapped in durable-feeling non-removable cover, the top of which is quilted into about 1.5" of foam. The side panels reminded us of a t-shirt material. The side panels feel substantial, and four functional handles are a welcome addition, allowing us to more easily move and reposition the mattress. We classify the Brooklyn Signature mattress as a Medium Firm mattress, just to the firmer side of what we'd call medium. That means we had a feeling of floating on top of the mattress as opposed to sinking deeply into it. That effect is somewhat mitigated by the plush cover, which has a nice softness to it. Note that there are two other versions of this mattress, a "Firm" version and a "Soft" version. More on that in the Back Support section below. As noted earlier, we didn't sink deeply into the Brooklyn Signature mattress, about what we would expect for a slightly firmer mattress. The plush cover does feel soft, and has a pillowy quality. Overall, we felt cushioning was a good blend of the two qualities, but if you like to really sink into a mattress, the Soft version of the Brooklyn Signature Mattress is probably a better choice for you. We look at responsiveness in two ways. First, we examine how quickly a mattress springs back after being depressed, then we take a look at bounce qualities. Since the Brooklyn Signature mattress does not include any memory foam, we were not surprised to find that it did not have any of that slow-responding melting quality of memory foam. Rather, the Brooklyn Signature mattress sprung back into position quickly. As for bounce, we would expect some springiness due to the layer of pocketed coils, and that was indeed the case. While the top layers of foam didn't impart much surface-level bounce, we did feel the bed pushing our tester back into the air when he dropped his weight onto the bed. If you like a mattress with a traditional amount of bounce, this would be a good choice. Overall, we thought the Brooklyn Signature mattress offered excellent support in all sleeping positions for our 200-lb. tester, and we felt that would be the case for a wide range of individuals of average size. In some cases, we felt that the Soft version of this mattress might be better for very lightweight back and side sleepers, and that the Firm version might work out better for heavier (250 lbs.+) people, especially back and stomach sleepers. The Brooklyn Signature website has a breakdown of who they think the different softness levels would be best suited, and in our evaluations, we thought those rang true with what we observed. 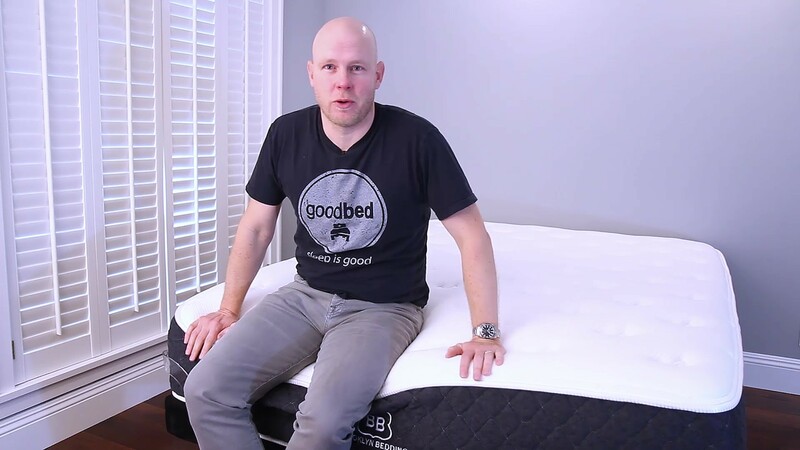 Our 200-pound tester felt this mattress to be exceptional while on his back, with almost ideal spinal alignment, with a well supported lumbar area as well. Our tester's hips sank just deeply enough into the mattress. Very light people (less than 150 lbs. or so) might prefer the Soft version of the Brooklyn Signature bed, while heavier people (250 lbs.+) might prefer the Firm version. But for the majority of people of average weight, we felt that the Brooklyn Signature bed offered excellent support for back sleepers. Spinal alignment for our tester in the side position was also very good. His shoulders were able to get deep enough into the mattress to allow the top of his spine to remain level. Overall, we believe the Brooklyn Signature mattress would provide good spinal alignment for most side sleepers. Lighter individuals might opt instead for the Soft version, to ensure that hips and shoulders sink deeply enough, which heavier people in the 250 lbs. and over range might instead opt for the Firm version. Achieving good spinal alignment for stomach sleepers can often be trickier as the hips can tend to sink down too far with some mattresses, but our tester felt well supported in this position, with no feeling of an over-arching back. And we felt that stomach sleepers of a wide range of body weights would also feel well supported in this position. Overall, we found the pressure relief offered by the Brooklyn Signature mattress to be excellent. 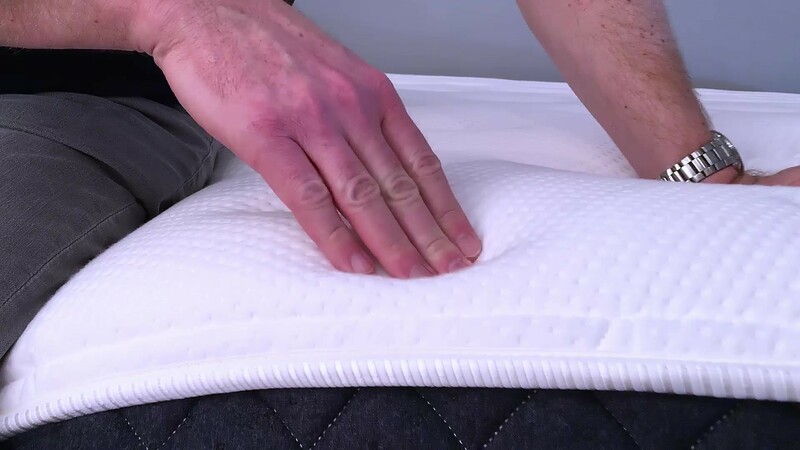 The progressive layering system--where the mattress progresses from soft layers to firmer layers gradually--worked very well, allowing our testers' shoulders and hips to sink into the mattress without "bottoming out" on firmer layers. Overall, we experienced no issues with joint or pressure issues. For those that have acute pressure relief needs, such as those living with fibromyalgia or arthritis, the Soft version of the Brooklyn Signature mattress might be an option. Very light people (or those with particularly wide hips or shoulders) might also opt for the Soft version, while those heavier than average might go for the Firm version. 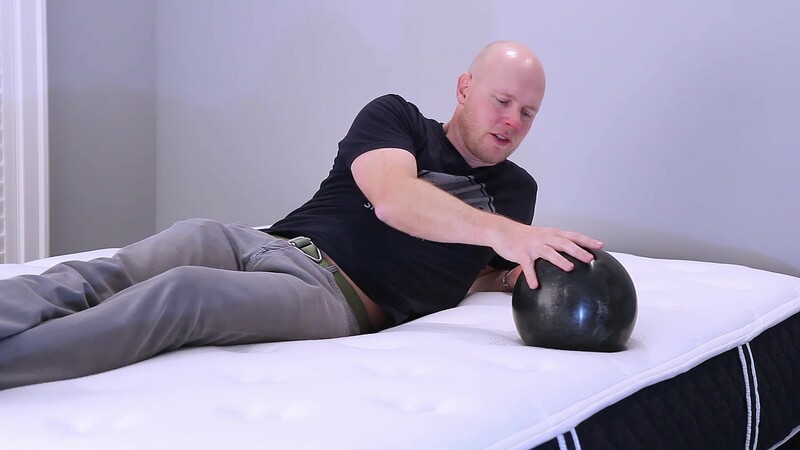 With a bowling pin standing upright on the Brooklyn Signature bed, we tested motion isolation by dropping a 16-lb. bowling ball on it, as well as the whole weight of our 200-lb. tester. In both drop tests, the bowling pin barely moved. We felt that the Brooklyn Signature bed would be an excellent choice for couples who don’t want to feel their partner getting in and out of bed or repositioning. For most people, we do not think that the Brooklyn Signature mattress will feel hot. First, its spring layer allows for lots of air flow, and because there is no foam around the edge of the bed, that allows for even better air flow. Additionally, Brooklyn Bedding says that its TitanFlex foam includes gel particles to help draw heat from the body. If "sleeping hot" is a known issue for you, the Brooklyn Aurora mattress might be worth a look. This version includes specific heat-management features. We currently have this mattress on hand and are testing it. While the Brooklyn Signature mattress does not have any specific edge-support features, we nonetheless felt that edge support was very good.When our tester sat on the edge of the bed, he sunk down quite a bit, but did not feel unstable at all. Similarly, when lying on the edge of the bed, he felt very well supported and not at all like he was slipping off. If you find yourself being pushed to the very edge of your mattress by kids or pets, the Brooklyn Signature mattress would be a good choice. One of the highlights of the Brooklyn Signature mattress, for our tester, was ease of movement, which was almost effortless. If you tend to change positions a lot, the Brooklyn bed performed extremely well in our view. In the case of the Brooklyn Signature mattress, the company makes no claims about the use of natural materials, however all of the foams used are certified to the CertiPUR-US standard, which verifies that a material has low VOC off-gassing as well as a lack of chemicals and other substances regulated by the CPSC. Steel coils, by their very nature, do not offgas, so that is another bonus. We gave the mattress an unscientific "sniff test" right out of the box, and while we noticed a faint 'new mattress' smell when we pushed our noses right into the bed, we didn't noticed a small while sitting on it. This is the type of odor that typically dissipates in a day or two. If you plan to use your mattress atop an adjustable base, the Brooklyn Signature mattress is a very good choice. In fact, the company even sells its own adjustable base (optional). We tested the Brooklyn bed with a standard adjustable base and found that right away, the mattress conformed nicely. Prices shown are list prices. Remember that GoodBed keeps our site current with the best available discounts on all online mattresses, many of which are exclusive discounts for our readers. Note that in the case of the Brooklyn Signature mattress, the company specifies it as an 11.5-inch mattress. We measured closer to 12.5". The Brooklyn Signature mattress is a 12.5-inch mattress (by our measurement) that's a hybrid of foam (5.5 inches) and pocketed coil springs (6 inches). In our view, it's a compelling blend of old and new, with the bounce properties of an innerspring mattress combined with the motion isolation characteristics of a foam bed. It all comes wrapped in a substantial and sturdy cover with four usable handles (more rare than you would think). When it comes to estimating the comfort lifespan of a mattress, we tend to use foam density as our best, albeit imperfect, predictor of how long a foam will retain its shape and resiliency. The foams used in the Brooklyn Signature mattress, however, are proprietary, meaning no other company uses them. For that reason, we are left without a track record by which to take an educated guess at longevity. Steel springs, however, certainly have a long track record for durability. While overall durability is a bit of a question mark, Brooklyn Bedding does offer a solid warranty, which should give consumers peace of mind. On balance, we feel that Brooklyn Signature mattress is a very good value, right in line with much of its online competitors. It's worth noting that the company offers a substantial discount (25% when we last checked) to certain groups, including active duty military and veterans, first responders, teachers, and students. If you fall into one of these groups, that could certainly tip the scale in Brooklyn Bedding's favor, particular if the Brooklyn Signature mattress fits your other criteria and preferences. Brooklyn Bedding includes free delivery to your door, which is not particularly unusual among its competitors. One of the biggest, if not THE biggest complaints about any mattress from consumers regards body impressions—the inability of a mattress to spring back, eventually creating a low spot/sinkhole in the mattress. As such, mattress warranties all contain a term defining how big a sag or ‘body impression’ (measured when no one is on the mattress) is considered a defect, and thus covered under the warranty. The industry standard for mattresses is generally between ¾” and 1.5”. Brooklyn Bedding has chosen to cover indentations that meet or exceed 1”. Practically speaking, that means any softening or sagging would need to be at least that deep before the warranty would offer you protection. See: Brooklyn Bedding warranty policy. Summary: Is the Brooklyn Signature Mattress Right for You? Overall, we found a lot to like about the Brooklyn Signature mattress. Based on our findings, here’s who we think is the best and worst match for a Brooklyn Signature mattress. Is the Brooklyn Signature bed right for you? Take our Mattress Match Quiz to find mattresses that fit your needs, based on your preferences and price range. Looking for more on the Brooklyn Signature mattress? Click here to visit their website at BrooklynBedding.com. Casper has a long track record selling mattresses online, but is its marquee mattress right for you?